In this installment of "He Was On That Team?" 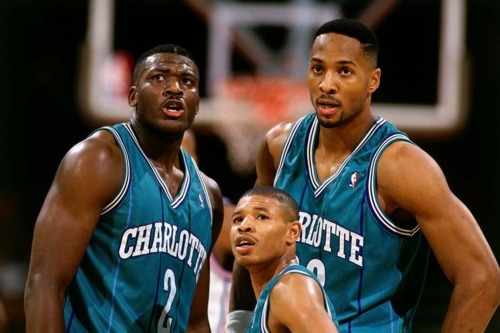 we look back at the influential 1992-1993 Charlotte Hornets. 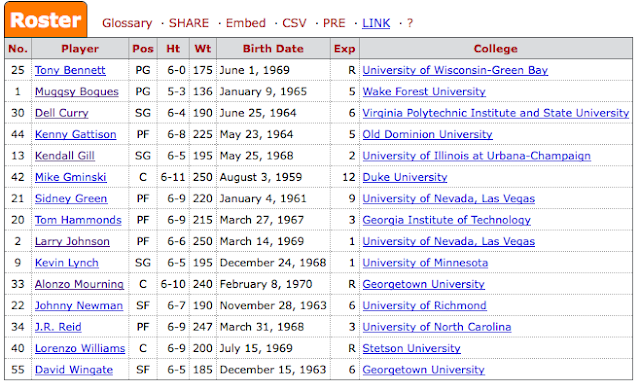 Four years later, after selecting Alonzo Mourning with the second pick in the 1992 Draft, the Hornets entered the 1992-1993 NBA season as perhaps the NBA’s most exciting young team. On the season’s opening night of November 6, 1992, the Hornets defeated the Washington Bullets 126-119. Their starting five consisted of talented second year power forward and general freak of nature Larry Johnson, third year utility-man shooting guard Kendall Gill, pesky defender and floor general Muggsy Bogues, journeyman small forward Johnny Newman and forgettable center Kenny Gattison. 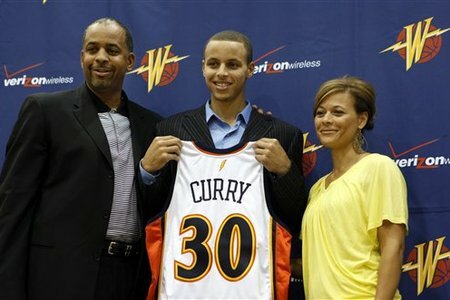 They also brought sharpshooter Dell Curry and sometime dynamic scorer J.R. Reid off the bench. As the season progressed, Mourning steadily improved into one of the best centers in league and, when added to the equally electric Johnson, the very useful Gill and the seasoned Bogues, Curry and Newman, helped to create a team that was able to hold its own with a very competitive NBA field. Take a look at the contenders from the 1992-1993 Season: Jordan’s Bulls, Barkley’s Suns, the Ewing/Starks Knicks, Miller’s Pacers, the end-of-the line Celtics, the Daugherty/Price Cavaliers, the underrated Petrovic/Coleman/Anderson Nets, Olajuwon’s Rockets (they won the title the following season), the Kemp/Payton Sonics, Robinson’s Spurs, Drexler’s Trailblazers, and the the Malone/Stockton Jazz. I mean, that might be the most difficult field in NBA History. Mourning finished the season averaging 21.0 points, 10.3 rebounds and 3.5 blocks and was the runner-up to Shaq in the Rookie of the Year voting. * Meanwhile, Larry Johnson put up averages of 22.1 points, 10.5 rebounds, 4.3 assists, countless furious dunks and played in the All-Star game. The Hornets upset the Boston Celtics in the first round of the playoffs that season before losing to the far superior Ewing/Starks Knicks in the Easter Conference Semifinals. With Johnson and Mourning as their superstar front court anchors and Bogues, Gill and Curry in solid complimentary roles, the Hornets were poised to be the next big team of the 1990’s along with the Orlando Magic and the Seattle Supersonics. They had one of the best home crowds in the entire NBA and their arena, the Charlotte Coliseum, was called “The Hive,” possibly one of the greatest stadium nicknames of all-time. The Charlotte Hornets Starter jacket is perhaps the most iconic piece of American sports apparel and Larry Johnson’s “Grandmama” commericals were the leading example of sports advertising (along with the Lil’ Penny commercials) during the great sports media boom of the early to mid-90’s. So, what happened? Well, Johnson and Mourning actually never got along. Similar to Shaq and Penny in Orlando, they were both young, talented superstars on the same team in an era where popularity, money and notoriety were becoming increasingly important after the Bird/Magic/Detroit Pistons golden era of team basketball. Looking back from our current epoch of Big Threes and Super-teams, the 1990’s were a landscape of young, headstrong stars, with outlandish contracts they could never live up to on teams that weren’t actually very good. So, a superstar had to stand out, whether through the size of their contract or through their endorsements. Alonzo and Larry clashed, Larry sprained his back and was never quite as explosive as he once was and each of them left Charlotte after the 1995-1996 season. Johnson to the New York Knicks and Mourning to the Miami Heat where they both took part in memorable (and sometimes difficult to watch) playoff battles for the rest of the decade. Muggsy Bogues remained on the Hornets until the 1997-1998 season when he was traded to the Golden State Warriors. He played another season for the Warriors before finishing out his career on the Toronto Raptors. Bogues retired in 2001 with career averages of 7.7 points, 7.6 assists and 1.5 steals. He also retired as the most beloved figure in the history of the Charlotte Hornets franchise as well as an iconic athlete for anyone who grew up in the early 90’s. Kendall Gill left the Hornets after the 1992-1993 season and was a big contributor on the Payton/Kemp Supersonics teams from 1993-1996, most notably the #1 seed Sonics team that was upset by the Dikembe Mutombo-led Denver Nuggets in the first round of the 1994 Playoffs. During the 1995-1996 season, he was traded back to the Hornets for thirty-six games. After that, he was a key rotation player for the competitive Stephon Marbuy New Jersey Nets teams and actually led the NBA in steals during the lockout shortened 1998-1999 season. He also made a cameo on the pilot episode of a little watched Nickelodeon sitcom called “My Brother and Me.” One of my favorite under-the-radar players from the 1990’s. Dell Curry played for the Hornets until the 1997-1998 season and was a solid role player during the Glenn Rice era. After that, he spent a year in Milwaukee before finishing his career in Toronto where he was reunited with Muggsy Bogues. He retired as the Hornets’ all-time scoring leader and currently ranks 35th in three pointers made and 29th in career field goal percentage. He is perhaps know most famously known for being Steph Curry’s father and for standing smugly in the stands with his beautiful wife at all of Seth Curry’s games at Duke. 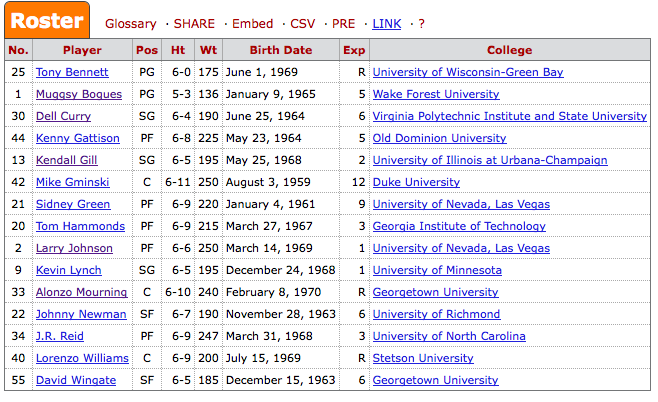 For anyone who grew up in the 1990’s, the 1992-1993 Charlotte Hornets hold a special place in your heart. Players like Mourning and Johnson were so prominent in advertising and the fading “monoculture” that they will be embedded in our minds. Those of us who were aspiring NBA stars saw Muggsy Bogues as some kind of beacon light that told us it was possible to make it even if we weren’t the tallest guy on our travel teams. All of us wore a Hornets Starter jacket at one point from third grade through sixth grade. We loved and were baffled by Grandmama. The 1992-1993 Hornets showed us everything that was great and precarious about the trends of the NBA in early 1990’s. Maybe the players didn’t end turn out to be as legendary as we initially thought, but the impressionable, giddy memories of the first Clinton term still remain.